The award-winning MX500C mobile headset from Plantronics gives you high-performance sound for clearer calls. The MX500C features a pivoting WindSmart voice tube that reduces wind noise and allows you to position it for optimal sound clarity. Inline mute and volume controls offer the ability to get every call just right. the MX500C's Flex Grip design provides you with a secure and comfortable fit for extended wear. This headset will work with headset-ready cordless phones with 2.5mm headet jacks and it is compatible with many headset-ready mobile phones with 3.5mm headset jacks including Nokia, Audiovox, Kyocera, LG, Motorola, Samsung and Apple smartphones. A 2.5mm to 3.5mm adapter cable (not included) may be required to use this headset with your smartphone. What are the reviews like for the MX500C? Can you connect the MX500C to a computer? Can you connect the MX500C to a smartphone? Can you connect the MX500C to a tablet? Can you connect the MX500C to a cordless phone? Can I use it with my office desk phone? Does it have a volume control? Does the MX500C have a mute feature? What is the Flip Grip earbud? Can I wear it while doing sports? Will this work on my motorcycle? Is it comfortable enough to wear all day? What is the difference between over the ear and under the ear? Can I wear my glasses while wearing the MX500C? What is a voice tube? Can I wear it on either side of my head? Q: What are the Reviews Like for the MX500C? A: The Plantronics MX500C has average ratings between 3.7 ~ 4.3 stars. These ratings are from users and users of the headset. As with all ratings, results are averaged, so while many people may find this headset a good value, there are other people who have had issues with it. Your experience will be unique to you, and we hope that you find the MX500C to be a good value. Q: Can you connect the MX500C to a computer? A: The plug on the Plantronics MX500C is 2.5mm in diameter, so you will need a 2.5mm to 3.5mm adapter to connect it to a laptop or computer audio input/output jack. Q: Can you connect the MX500C to a smartphone? A: Smartphones typically have a 3.5mm jack for headphones and corded headsets, so you will very likely need a 2.5mm to 3.5mm adapterto connect to most smartphones. Q: Can you connect the MX500C to a tablet? A: Similar to smartphones, tablets like the Apple iPad and Samsung's Note series have a 3.5mm jack for headphones and corded headsets, so you will need a 2.5mm to 3.5mm adapterto connect to most tablets. Q: Can you connect the MX500C to a cordless phone? A: Absolutely! Most cordless phones for consumer and business that have headset jacks (not all do) will have a 2.5mm diameter jack for headsets. 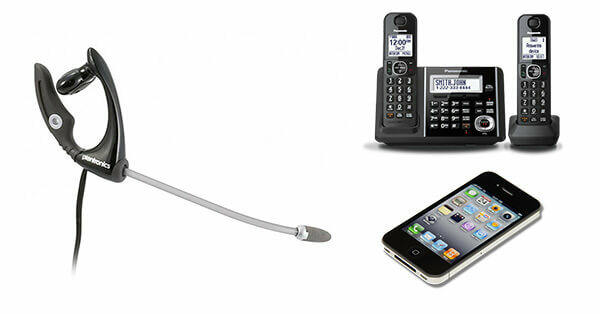 The MX500C has a 2.5mm jack and it is primarily designed to be used with cordless phones. Q: Can I use it with my office desk phone? A: That depends on your phone. If your deskphone has a 2.5mm male jack plug (the same kind you'd find on a cordless phone handset), then you're in luck. If you have an IP phone that accepts a USB headset, then you can purchase a 2.5mm male jack to USB adapter which will give you the ability to connect your MX500C to your office phone. A: The Plantronics MX500C features an inline one-touch volume control. Q: Does the MX500C have a mute feature? A:The Plantronics MX500C features an inline one-touch mute control. Q: What is the Flip Grip earbud? A:The Flip Grip® earbud is a special feature of the Plantronics MX500C to help keep the headset securely and comfortably attached to your ear. As with all earbuds, it fits comfortably in your ear (right or left). The Flip Grip® tucks behind your earlobe, applying a light pressure which keeps the MX500C headset in place. Q: Can I wear it while doing sports? A:The MX500C is not specifically designed to be used during sporting activities. That being said, you can probably use it for a variety of sports that aren't physically jarring. Walking, cycling, hiking, rowing, golfing, and other relatively smooth activities should be fine. We wouldn't suggest wearing it while playing organized team or contact sports like football, soccer or hockey. Q: Will this work on my motorcycle? A:In a full-face motorcycle helmet, the MX500C might be a good choice, especially at city speeds. The wind noise reduction technology might be up to the task of reducing wind noise in a sheltered environment like your helmet. However, if you are using a half helmet or open face helmet, the lack of protection from wind may overwhelm the noise reduction technology. You may also have trouble hearing the person you're speaking with, especially if you've got loud pipes. Q: Is it comfortable enough to wear all day? A:Yes! Well, let us put that into context. Many people report that the Plantronics MX500C headset is very comfortable and they say they comfortably wear it all day. Other people don't. A majority seem to report that it's a great all-day wearable headset, so chances are it will probably work out for you. Try one out and see! Q: What is the difference between over the ear and under the ear? A:Over the ear headsets are worn over the ear. The unique Flip Grip® on the Plantronics MX500C is designed to loop under the earlobe and apply gentle pressure on the back of the ear. This means it doesn't interfere with glasses, safety glasses, goggles or anything else you might have to wear over your ear. Q: Can I wear my glasses while wearing the MX500C? A:Absolutely! Unless you have an unusual style of frame, the MX500C can be worn, unobtrusively, without interfering with your glasses. Q: Does it have a battery? A:No. This is corded headset, so the power is provided by the device you plug it into, which is usually smartphone. The MX500C has low power consumption so shouldn't cause your phone battery to drain excessively. Q: What is a voice tube? A:A voice tube is sometimes called an omni-directional microphone. The tube transmits the speaker's voice. Plantronics voice tubes are designed to be resistant to wind noise. For the best results, make sure you position the end of the voice tube approximately 2 finger-widths from the corner of your mouth. Q: Can I wear it on either side of my head? A:Yes! Due to the earbud design and the unique Flip Grip®, the MX500C will stay secure whether you use it in the left ear or the right.